Each year the SCORE Conference attracts more than 100 like-minded executives in customer experience, customer service, human resources, marketing, and sales roles—whose responsibilities focus on customer and employee engagement. Nowhere else will you find such a select group of industries leaders sharing their expertise on innovative yet provide strategies for driving customer loyalty and employee empowerment. VISIT the SCORE Conference page. Frontline employees are the face of your brand. Recognize that, during every customer interaction they ARE your company. Customer relationship soft skills training is essential to their success. Our comprehensive curriculum is available online and on-site. Senior managers' expertise in CX is vital, as well. Showcase your leadership team's CX skills with CEMPRO Certification. Our in-depth program includes training on our proprietary CEMDNA Playbook Strategy and a two-part certification exam. Recipients of this demonstrate mastery of CEM best practices and standards of excellence. These include implementing and managing customer satisfaction and employee engagement strategies. 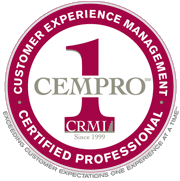 The CEMPRO℠ certification programs includes comprehensive training.